TSNC MEGA CHRISTMAS DAY GIVEAWAY! £1800 PRIZE BUNDLE TO BE WON!! Merry Christmas! I hope you’re all having a wonderful start to your Christmas day, and just to add to the merriment I’m hosting a massive surprise giveaway! Beaverbrooks – Silver Rose Gold Plated Pendant and Earrings Set, worth £100. This is basically everything that I’ve given away over the last 24 days, with a couple of products changed here and there. The total value of all these amazing prizes comes to nearly £1800! This giveaway will run for three weeks, and it’s open internationally. Just enter via the Rafflecopter widget below, and please do feel free to drop me a line if you have any questions. Wooow! This is an amazing giveaway! Happy Holidays! Merry Christmas 🙂 Amazing prize. Wow! This is an amazing prize! Merry Christmas! Absolutely amazing last day!! Thank you so much for this month of give-aways! Thank you for the fantastic giveaway!! Merry Christmas!!! Ahhhhh!!!! So Exciting!!! Extraordinary giveaway! Had a wonderful Christmas with fam, hope you do as well and a happy New Year!!! Merry Christmas, I hope you’ve had a great day. Such an amazing prize. I am literally drooling at the amount of goodies are here! Merry Christmas! What a way to end the Advent Giveaways!!! what an utterly amazing giveaway! Wishing you a very Happy Chirstmas. Ooh yes please, what an amazing way to end one year and start another. Fabulous giveaway! what a wonderful start to the new year for the lucky winner. What a fabulous prize line up! Anyone would be awestruck if they won! I’m really hoping it will be me! I m thinking of so many I could share with! Thank you for the wonderful opportunity! This giveaway is crazy awesome!!!! Merry holidays! Wow, this is an amazing giveaway!!! Good luck to everyone and happy holidays! Xmas is over already, its been an amazing time, hope you guys have had a brilliant time. Wow, this is incredible! Happy Holidays! I’m so happy to have been introduced to so many new and wonderful brands!! I would be in shock if I win, you have so many entries already but I have my fingers crossed. Wow! awesome giveaway! Thank you! happy New year! What lovely prizes – truly something for everyone. Fantastic prize! Thank you for the chance to win! An amazing array of lovely things, this has just led me to some wonderful sites, thanks. I love all the items in this giveaway ! Beyond amazing giveaway so many great prizes thank you so much for the chance of winnng id be so happy if i won this!! Wow Michelle – you are so generous! Such a fab giveaway! Someone is going to win an amazing prize. Awesome giveaway and Happy New Year to you. What an amazing giveaway! Happy new year and I hope 2016 is good to you. Simply amazing, thanks for the chance. Unbelievable dream of a prize T?tally amazing. Thanks.?? What a fab competition – it must have taken you hours to organise! All of it. How very generous of you! WOW, what an amazing selection. Thanks so much and Happy New Year 🙂 . What an amazing selection of prizes, I’d love to try the joico bits, I’ve heard great things! What a great giveaway. I hope I am in time to enter. What a fabulous giveaway, so many great products, thank you. Wow would be better than Christmas! I think we would be 3 very glamorous ladies by the time we had finished. Thanks to you and all the companies for giving us all the chance to win. What an amazing prize. Thanks so much. What a brobdingnagian of a prize! Love that this is International and such a generous prize! Good luck! This is definately the best giveaway ever. Someone’s going to be very happy ????????????? Such a generous giveaway! Wish you have a wonderful year! Super amazing prize – would make this new first-time mum feel glam again! This would be unbelievable – what a prize!!!! Thanks for this amazingly generous giveaway! 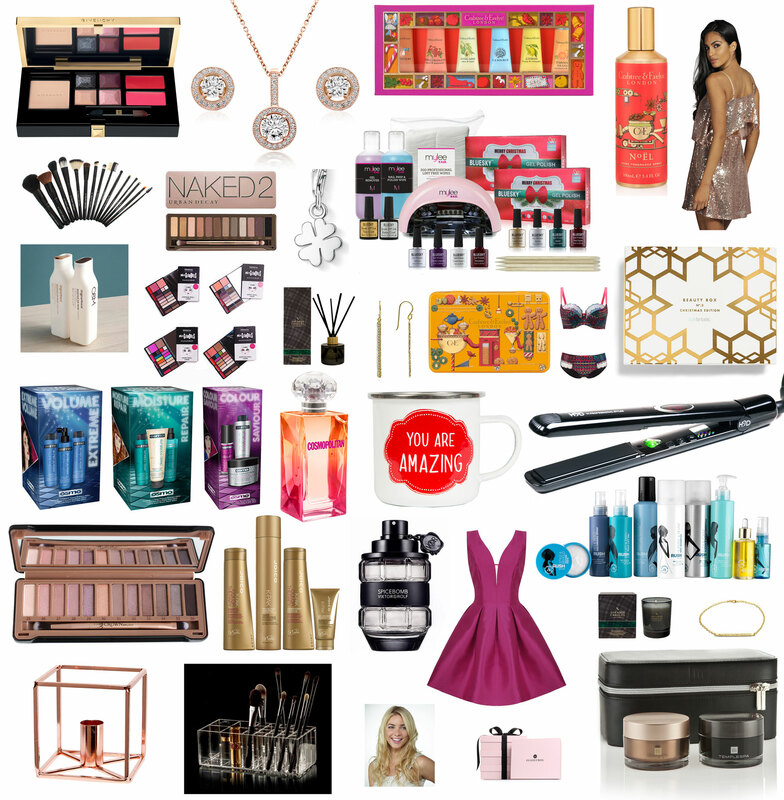 Such a great giveaway – major beauty lust!! I never won something big in my life hope to win this tym em lucky ? every day every year my bad luck is follow me hope for the best this tym ? fingers crossed ?